Okina is a bamboo cutter in ancient rural Japan. One day in the forest, he finds a tiny baby in the folds of a bamboo shoot. He brings the creature home to his wife Ounaa and they decide to keep her and raise her as a princess. She is clearly not of this world. Kaguya grows at an unnatural rate, soon maturing into an uncommonly beautiful young woman. Since Okina has now also found a cache of gold and treasure in the forest, every suitor wants Kaguya. But this is not a fairy tale of courtship and marriage. 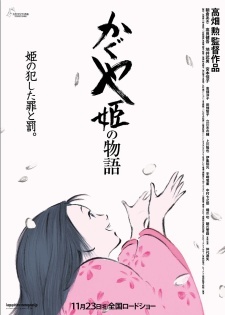 Watch Kaguya-hime no Monogatari Episodes Online at Animegg.org. Kaguya-hime no Monogatari is available in High Definition only through Animegg.org. Choose an episode below and start watching Kaguya-hime no Monogatari in Subbed & Dubbed HD now.